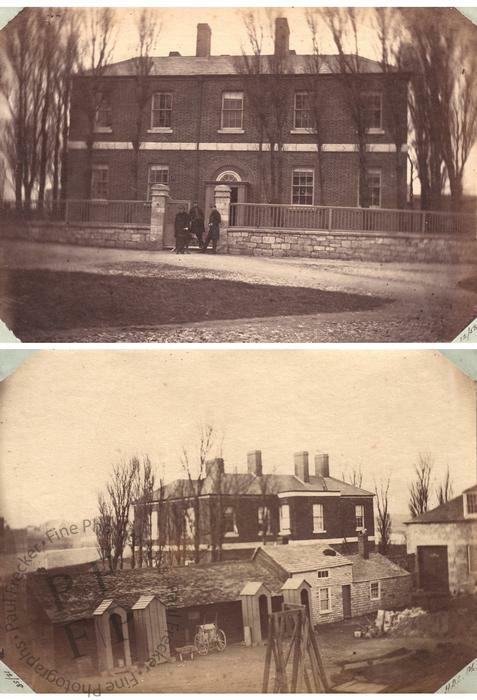 Two albumen prints showing the office of the Royal Engineers at Devonport. Inked inscriptions identify the views as ‘Royal Engineer Office, Devonport’ and ‘Rear View of the R. E. Office.’ Further inscriptions date the two photographs to December 1858. Condition: the prints presents a few small imperfections but are otherwise in excellent condition, with good tonal range. They are mounted on the same pale green album page. Dimensions: the prints measure 4.3” by 6.2” (11 cm by 15.8 cm); the album page measures 10.4” by 7” (26.5 cm by 17.9 cm).